Dakhla is a desert city in the middle of Western Sahara, Morocco. This remote city is about 1500 km from Casablanca and is located in a small peninsula on Morocco’s Atlantic Coast. 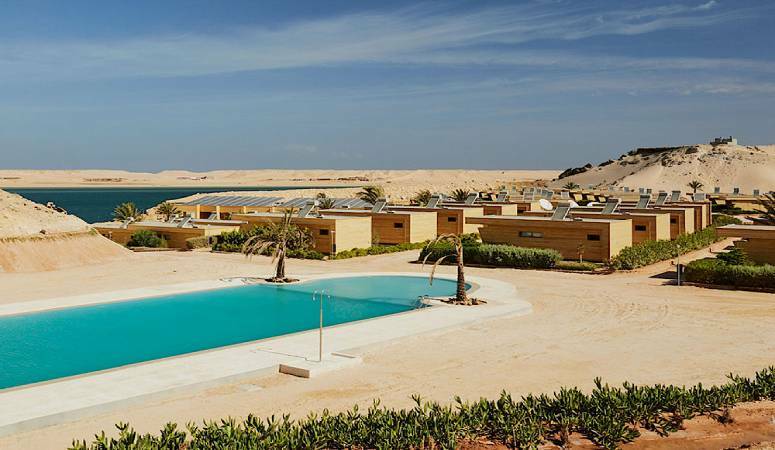 Surrounded by the picturesque sand dunes and the beautiful blue lagoons, Dakhla is an ideal holiday destination. In a span of a few years, the city has risen from being unknown to becoming a popular tourist attraction providing adventurers and nature enthusiast with a combination of both beauty and adventure. The perfect wind stats and weather conditions of the area have made Dakhla a popular location for kitesurf sports. The average temperature in the area is mostly above 20°C and winds are strong and consistent almost all year long. The water is also perfectly flat and has massive shallow areas making it an ideal place even for Kitesurf learners, beginners and for those who want to improve their skills. Dakhla is the kitesurfing capital of Morocco. It’s calm flatwater lagoons and the perfect winds all year through making it the best destination for Kitesurfing. It is an ideal destination for Kitesurfing enthusiasts of all level’s beginners, intermediates, professionals. Dakhla offers ideal conditions for Kitesurfing all year round. The geographical location of the region brings winds from the northeast where the period between April to September being the windiest. July and August are the two months with the strongest winds. The weather in Dakhla is best for Kitesurfing all year as the temperature ranges from 20°C to 30 °C in the summer with a drop of 12°C to 15°C at night. Based on the summer's temperature, it is best to pack boardshorts or bikinis for day and a warm hoodie and pants for the evening. In winter, the temperature drops at least five more degrees. The water temperatures stay almost the same all year long and are normally between 19 to 20 degrees on a monthly average base. It doesn’t drop below than this. When the winds are strong, it might feel colder, so you’ll need longer wetsuit especially in the winter time; however for the summer a shorty should be sufficient. What kind of Kitesurfing Gear I need? For an ultimate kitesurfing experience in Dakhla, it is best to take your full quiver (kitesurfing gear). Most kiters make the quivers based on various sizes to cover all types of wind strength range. A popular arrangement of quiver for good kiters is 9 and 12m. The selection of the Kite size is generally based on body weight and the ability to stand the wind strength. For someone with a lighter weight might require 7, 9 or 11m kite in the 20-30 knot wind. For beginners, the quiver formation may include 10, 11 or 12m kite which would give them the ability to easily learn and progress in Kitesurfing at light to medium wind range. As a popular Kitesurfing destination, Dakhla also has specialized Kitesurfing camps offering kitesurfing lessons to different levels especially beginners. These Kitesurfing lessons are carried out by professionally trained instructors for every level of Kite-surfers. There are kitesurfing gear rental options available too but are only given to those with a certified level of skill. Most kitesurfing instructors speak English, French, Spanish, and Arabic. 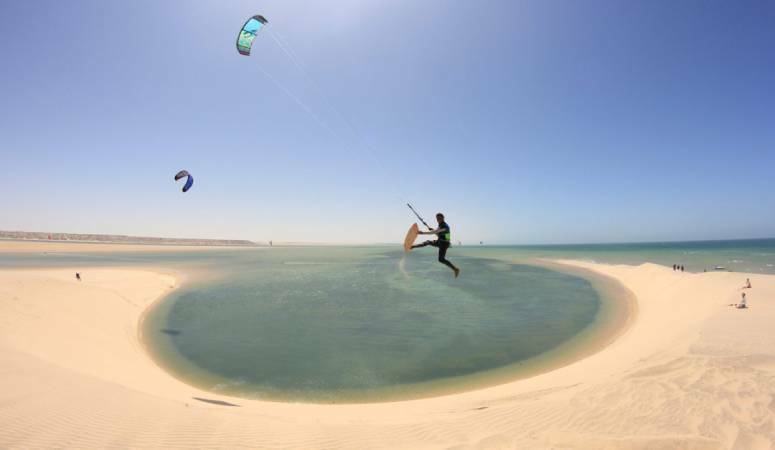 The large flatwater lagoon in Dakhla provides a spot for every level of Kitesurfing. Whether you are a beginner or an expert, the place has a perfect spot for you. There are rescue boats all around, so the safety is ensured. Main Lagoon – The lagoon offers the best kitesurfing experience for all levels. With it being enormous in size, there are different spots for beginners and adventure enthusiast alike. The choices are many, and the perfect water and wind conditions make it an ideal kitesurfing experience spot. Wave Spots – There are wave spots in Dakhla for advanced kitesurfing experience. These spots offer side to side off winds and amazing wave sailing conditions. Dakhla also offers a variety of exciting attractions other than kitesurfing. SUP (Stand up paddle boarding) is a perfect activity to explore the beauty of the lagoon. Experience the local culture and food by taking a trip to the local market and souk, enjoy traditional cuisine and the popular Moroccan tea. Visit the oyster farm, explore the beautiful beach, enjoy yoga, a relaxing massage and the Hammam. On the other hand, If you’re looking to train yourself on Kitesurfing head out to the Dakhla cable park and perfect your skills. Go on an adventure on a boat excursion or on a 4x4 desert excursion to explore and enjoy the magnificent desert landscapes, or perhaps even take a camel ride and trek the area!. 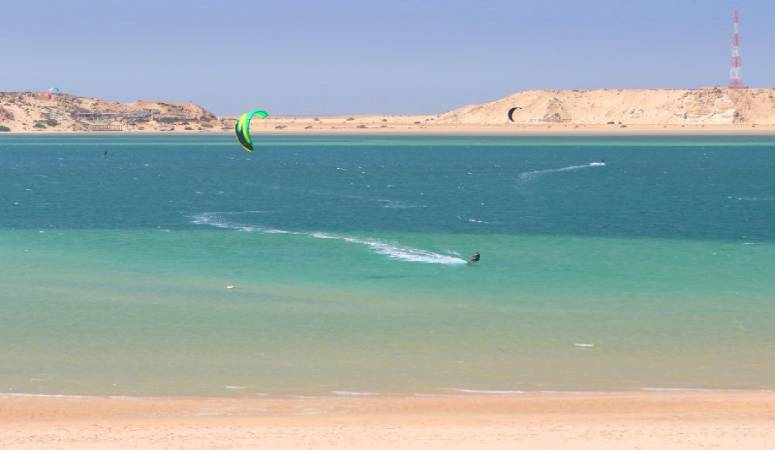 Dakhla is the ideal destination for all kitesurfing and water sports lovers. The flatwater lagoon, world-class waves, and beautiful landscapes make it an exciting vacation spot.